SPUDS was launched in 2012 as proactive response to the decision to trial genetically modified (GM) blight resistant potatoes in Ireland. Irish farmers have grown naturally blight resistant potatoes for years with considerable success. Although these varieties have the potential to reduce fungicide use and lower our carbon footprint, they are not considered commercially viable. To create public debate around this issue SPUDS gave away 1.5 tonnes of non-GM blight resistant potato seed to anyone willing to join our study. Over 300 growers countrywide took part. In possibly the worst season for blight since the famine, citizen scientists documented the performance, yield, quality and taste of three varieties. Over 90% of those who responded did not get blight, enjoyed the taste of the varieties and wanted to grow them again. As a result demand for naturally blight resistant potato seed outstripped supply in 2013. The study embraced other issues that determine sustainability. Up to 50% of good quality nutritious potatoes are rejected simply because of their shape. Is demand for perfection consumer or market driven? 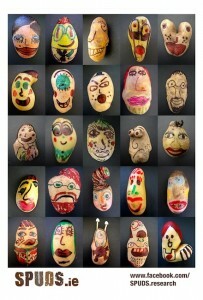 SPUDS got kids to engage in this issue by creating lovable characters out of wonky spuds. Then we developed our own brand of crisps to communicate what we were learning. 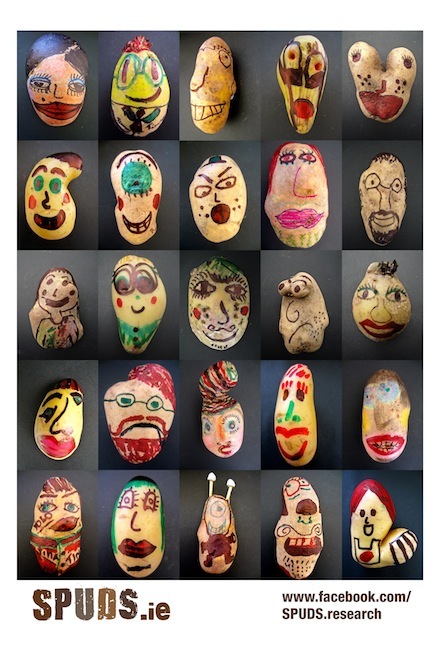 Our first edition of SPUDS.ie ‘crisps with a conscience’ featured rejected spuds, demanding equal rights for ALL potatoes, no matter what size, shape or variety. The crisps taste, ethical agenda, and compostable packaging won us a Bridgestone Award. Crisp sales funded SPUDS promotion at 6 festivals and a TasteFest in Dublin where the public were invited to taste blight resistant spuds. More details and images can be found in our SPUDS-NEWSLETTER-Autumn-2012. In 2013 we grew a commercial scale field of blight resistant Axona to provide sample quantities to chefs in successful Dublin restaurants. Their excellent testimonials have built demand for the varieties and strong alliances that indicate the potential for a large-scale demonstration project. In 2014 SPUDS partnered with Country Crest, large scale potato growers who are a member of the Irish Potato Federation, verified members of Bord Bia’s Origin Green Programme and fully committed to sustainability. With the support from the Sarvari Research Trust, Country Crest are currently growing a large scale trial of two Sarpo blight resistant varieties, Axona and Blue Danube. They will be tracking the suitability of these varieties for their product range which is sold in the larger supermarkets around the country. We have also partnered with the Tolka Area Partnership and Coolmine Therapeutic Community to explore the integration of the SPUDS mission and objectives in their ‘Recovery Through Nature’ therapeutic horticulture Programme. This project involves recovering addicts as citizen scientists in our research activities to assess the impact on their recovery and re-entry into the community. The Coolmine Team are working with SPUDS to reclaim derelict sites for new allotments and community gardens using Sarpo potato varieties. The profuse foliage of these vigorous potatoes will smother existing weeds and clear the fields for planting the following year. A healthy crop of potatoes will be produced in the process. The crop harvested from these reclaimed sites will be used in the development of products that will be prepared, packaged Coolmine team and sold in local markets by as part of a holistic process, field to fork, to maximise opportunities for social exchange. Products will include decoratively packaged Christmas SPUDS and SPUDS.ie ‘Crisps with a Conscience.” The Coolmine Team will feature in the branding of the project/products. Coolmine’s project is modelled on the highly successful Phoenix Futures ‘Recover Through Nature’ Project in the UK. Our collaboration with the Coolmine Team will be evaluated as it is being developed. 30% Increase retention of clients who participate in the programme. Decrease in the amount of behavioural interventions for clients who participate on an ongoing basis. Communication barriers are overcome and relationships are nurtured and strengthened through a shared objective . If you are growing blight resistant potato varieties or are interested in any aspect of our research activities we would love to hear from you! Use the contact form on this site to communicate your interest. Follow SPUDS activities on Facebook & Twitter to get updates on our activities.